In May of 2006, I was on Capitol Hill in Washington, D.C. preparing to go to Senator Clinton’s office for a meeting with some of my peers. While we were outside the building – Senator Clinton walked by, said hello and that she would see us in a few minutes in her office. Moments later out comes the junior Senator from Illinois, Barack Obama. 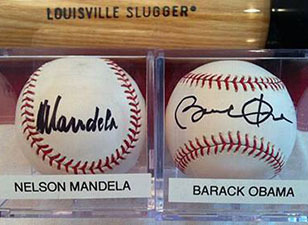 Before he could say a word – I pulled out my baseball and said to my friends that there was no doubt that he would ascend to our nation’s highest office based on his oratory skills at the 2004 Democratic Convention. But I thought he would achieve that in a decade or so – definitely not two years later. I asked him to please sign my baseball and told him that I’m pretty sure that he would be President someday. He must have been laughing inside – because it was not even public that he was about to launch his White House campaign. He reluctantly signed the baseball and then asked us if we were from Chicago? I told him we were from New York. He asked yet again, “Are you sure you are not from Chicago”? We responded the same as before that we were from New York. I was not done even saying New York before the Senator lit up a cigarette. I guess he did not want his constituents back in Illinois knowing that he was still smoking!